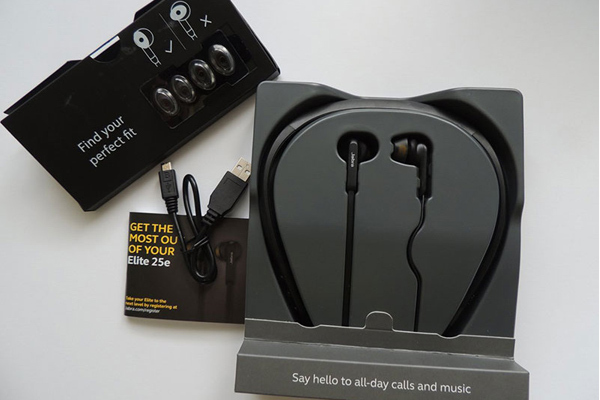 Now, Denmark-based Jabra, a subsidiary of GN Netcom that makes in-ear and on-ear audio wear-able, offers Jabra Elite 25e headphones for Rs 3,999. The device essentially sports a neckband-style design and promises up to 18 hours of battery life. Is it worth considering? Let's find out. Jabra Elite 25e sports a plastic body that did not look cheap and we especially liked the matte rubberised texture that covers most of it. The left side houses a dedicated button that wakes up digital assistants either Google Assistant or Apple's Siri depending on the device it is paired with. It is useful for those who particularly depend on virtual assistants. The microphone is also placed on the left while an LED notification light sits underneath the grille. It lit up when the device was switched on, when we paired it with our smart-phone, and while charging. We found the omni directional microphone very competent in making and receiving calls. It is also wind-protected that ensured we did not experience sudden and harsh sounds on windy days. The ear-buds, although they look a little odd because of their oblong shape, fit snugly. Two extra pairs (in small and large size) come complimentary in the box. The build of the buds is such that they compress when they are worn and then expand to fill the gaps. Their base is made of gel padding that can be removed. The right side of the headphone houses three physical buttons for the usual playback functions like pause or play and volume control. The company has marketed the device to last for 18 hours of continuous usage. However, in real life, Elite 25e lasts a little over 16 hours which is still impressive for a Bluetooth headphone at this price point. The device is slightly bass heavy and the overall sound signature weighs more on lower frequencies which in our opinion should appeal to most users. The neckband is especially made for exercise buffs and because of its IP54 rating, it is also water-resistant. Notably, the cover for the micro-USB charging port on the headphone's underside is also protected. The headphones paused the music when we just attached both ear-buds (that come with the in-built magnets) to each other. This remarkable feature also ensured that they do not dangle about too much when not plugged into our ears. The wires have a rugged feel and we did not see them getting tangled easily. What does not work? We found the headphones slipping off our shoulders when we leaned a little backwards as the weight distribution is uneven. In fact, the device holds more weight in its rear portion. It takes around two hours to charge the Bluetooth headphones from zero to full through a microUSB charging port. We would have loved to see Jabra opt for a USB Type-C port instead that could have enabled fast charging. Conclusion: We would recommend the headphones to those looking for a Bluetooth headset with good overall performance and excellent battery life without costing a bomb.